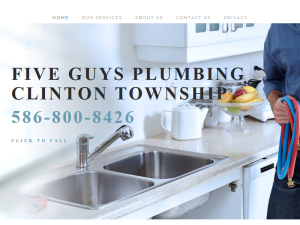 Five Guys Plumbing Clinton Township offers the best plumbing in the Clinton Township and Metro Detroit area. We have been serving our community for the past 20 years and offer a wide variety of plumbing services to handle any job you might have. From drain clogs and pipe replacements to plumbing installations of all kinds, Five Guys Plumbing Clinton Township is the place to go for your next plumbing need. We also offer 24-hour emergency plumbing for issues that happen when you least expect them. Our company goal is to be the first, and last, plumbing company you’ll ever need to call to get your job done. Call us today to schedule your no cost, in-home, estimate to see how our team can help with your plumbing need!